In the age of Trump a television series about a corrupt intelligence agency could be too closer to home to enjoy watching but AT&T Audience Network's ,"Condor" provides a new adaptation of the novel Six Days of the Condor by James Grady, as well as a different take on the film classic, Three Days of the Condor (1975). 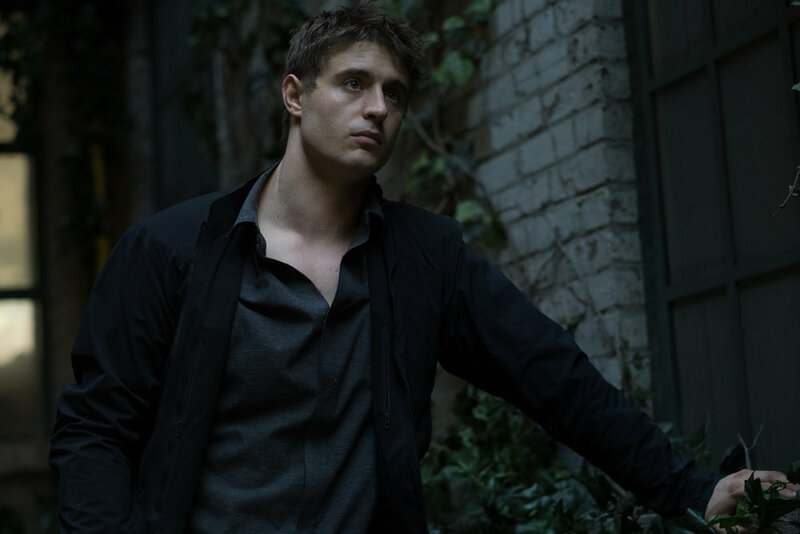 Expanding on both of these sources, Condor spends eight hour-long episodes telling the story of Joe Turner (Max Irons), a computer programmer or analyst for the CIA, who is unwittingly taken part in exposing a covert operation. We had the opportunity to attend a discussion with Showrunners Jason Smilovic and Todd Katzburg, and cast members, Max Irons, Mira Sorvino, Brendan Fraser, and Bob Balaban. What the advantages are to taking a title from 42-year-old movie that maybe lots of audiences don't remember rather than just doing a new conspiracy thriller with a completely different title that doesn't have the brand? TODD KATZBURG: Yeah. Well, the nice thing is certainly that we get to do our own thing with it and there's not -- we get to make this our own and hopefully take the fans of the movie and give them enough of what they're expecting, but also really make it our own and update it for a new time. By the second episode, we learn how dirty some of the people in the CIA are and the subterfuge. How long does it take before we learn how high the plot goes up the chain in the CIA? JASON SMILOVIC: So, for us, it was really important that this was not a whodunit but a whydunit. And we wanted to introduce a matrix of characters and to explore each of their individual reasons for their involvement in the plot. So we have a show that is essentially without villains, because each of the members of our cast who would be called villains are operating in accord with their own true necessity of their character and they're doing what they think is the good thing to do. So I would say by certainly Episode 6, you will know every member of our cabal of plotters. For the cast. I'm always curious when there's source material. Did you want to read the book? Did you prefer to stay away from it? With the movie, had you seen it? Did you want to watch it? MAX IRONS: I'm just speaking for myself. I'd seen the movie before becoming aware of this project. I was aware of its cult status. I watched the film after getting the part. And then, I remember there was a screening before the first day of shooting. Not a chance am I going to that. Yeah. I considered an acting policy of not actually letting people say Robert Redford's name on the set for fear that I'd just burst into tears. But I think he -- it's an inspiring film. The questions posed are inspiring. So to be able to explore those questions on a long-form format is wonderful, but I didn't linger on the film too much. BRENDAN FRASER: I'm a firm believer in working off the script you're given, personal view. BOB BALABAN: I'd seen the movie and loved it. And I also thought it would actually become confusing, because as similar in some ways as this is to the movie, it's uniquely its own animal. And, in a way, what I was thinking about when you guys were talking over there, what's really interesting to the people that know "Three Days of the Condor," I imagine it would create a, "Oh, I want to see this." And if you didn't know it, obviously it's interesting on its own. But it's kind of like a microscopic view of something that went by like a lightning bolt, and you get to watch in between all the cracks and crevices, which is, to me, where the juicy stuff lies that you can really spend the time to examine on a television series which you can't do in a movie. MIRA SORVINO: I felt because my character was really a new character that you guys created, she was a really fascinating character, Marty Frost. And I really had a lot of discussions with you all about where she was coming from and how she was not going to be your stereotypical sort of hardass, upper-level CIA woman that we see portrayed a lot on television, but somebody who's really -- has a rough, interesting, emotional past that makes her behave in unexpected ways, and she's a very complex and fascinating character to put your teeth into. So I didn't feel that I should dwell too much on the first film because she was a new entity that came with this production. But for that, I was very grateful to have such a rich role to dive into. It looks like this was actually shot in Washington. Was it? And what were the problems with, or if there were any problems, in shooting there? JASON SMILOVIC: We shot a few days in Washington, D.C., a few days in Florence, Italy. We shot in Jordan. And we shot mainly in Toronto. So the fact that the show looks like it was shot in Washington, D.C., we take that as a compliment. For Mr. Fraser. Nathan, very interesting character. In the beginning, it's almost humorous the way you were sort of put out the way your fellow operative slit his throat, the man's throat, and you were like, "Well, you know, I wanted to do -- I was handling it." Can you talk about Nathan, the character, as you read it and how you wanted to spool this person out? BRENDAN FRASER: Yeah. He's a nasty little piece of work in my view, but I can't taint the choices that I make with my own view. He has a grand-scheme plan of taking down an enemy that he perceives as being an act of righteousness and personally sees it as being -- and it will enable him to reconcile with his father. And I say that because each of the characters in this expansive case all have rich backstories that drive the choices that they make, that we all may think in watching this spy thriller are quite nefarious. But it rounds them out as being people just like myself and you, who feel that while they may be involved in what we see as being dastardly, to them they don't know that they're despicable; any villain never would. I found Nathan Fowler to be interesting because he's part of the military industrial complex. He's not getting his hands dirty outside of digging a hole to put some rodents into that had been tested upon -- keep watching, folks -- and makes choices that could have world-changing consequences. I found this interesting because it's counterpoint to, I think, a lot of the choices that I've been asked to make in the scope of my career. And I find it exciting to be able to work in the format of episodic television to pay off the arc of a story throughout the span of episodes, almost like chapters in a novel would do, rather than the challenge of working inside of 110, -20 minutes, whatever a feature film would be. So it was mostly satisfying for me, and my challenge was not to do any mustache twisting. But keep watching. So the training aspect and seeing Max jumping, doing stunts, all like that, that's going to change? In Season 2 he's going to be behind a desk? JASON SMILOVIC: Well, no, no. He will certainly be dealing with a new conflict Season 2, but it will not be the same DNA as the movie, the way the first season is. It will be a different strain of DNA. Max, and Mira, because Brendan just addressed that. Setting for TV -- I mean, we've seen you in different movies, in different characters. That aspect of not really knowing what's going to happen in Season 2, if there is a Season 2, not really knowing where your character is going, is that a plus or minus for you? MIRA SORVINO: I can say that I had moments of delight reading new scripts, seeing what fantastic monologues and scenes I was written for this character. I mean, my character is featured more heavily towards the end of the season. And as we approached it and more and more stuff came to the fore, I was, like, "Wow, this is really an incredible challenge." And I never would have been able to do all the things I did in one film. So it was really interesting, also, to have to navigate the shoals of the character and revelations about the character and self-discovery in the character. So in that sense, I really love the longer form. I love the 10-episode form. I think it's still concise. It's still tight. You don't run out of gas, and you don't run out of specificity, but you have more operatic arias to sing rather than short pop songs. MAX IRONS: It's funny. It's always a big decision, honestly, signing up for a commitment such as this. And when you first -- in my case, I only received Episode 1. And looking at other shows that have existed in the past, especially political shows, you have to take into consideration that you're going to be part of something that may have an angle and whether you want to associate yourself -- maybe not in the second season, but maybe three or for seasons down the line, whether you want to associate yourself or can, indeed, predict at all where politically it's going to end up. I have to say the thing that made me feel on safe ground was, frankly, meeting these two. You know, the argument and the ideological ideas presented in "Condor" are relevant and pertinent and complicated and nuanced. And, frankly, to have writers -- I'm trying to get myself a favorable position in Season 2 -- but to have writers who are wise and sensitive and considered, that gave me the confidence to sign on. Dealing with politics in the show, although it seems that the Nazari character may be a patsy, do you have concerns about taking something as big as targeting a specific American minority and not have it be the main plot? JASON SMILOVIC: Well, I do think that it is a -- I mean, Nazari was our -- is a catalyst in that regard because we wanted to draw the viewer in by kind of preying on their assumptions and their prejudices and to then, you know, show them that that those assumptions and those prejudices were wrong and that the path to fanaticism can be walked by anyone and that we are all susceptible to zealotry. The film deal with the conspiracy involves oil. And you talk about how this version has sort of its own predictions. What is really relevant about what "Condor" is saying. Does it have its own statement that is sort of specific about the state of the powers that be in the world today? We do have a lot of conspiracy shows, you know, "Homeland," etc. How is "Condor" different? JASON SMILOVIC: A lot of the time when you get into a conspiracy show, you wind up just dealing with a mysterious shadowy cabal kind of in secret rooms and mansions, and those people are controlling things for the sake of controlling things. In our show, our matrix of villains, who I even hesitate to call villains, each have very disparate reasons for doing what they're doing. And we have one character who's motivated entirely by greed. We have another character who is motivated by a desire to, as Brendan said, make his father proud and to reconcile that relationship. We have another character who really believes that he's doing something very good. We have another character who is a fanatic who believes that the CIA's job is to wage war against Islam. So this is not -- this is not really about the conspiracy per se. This is about -- I think we were very interested in how conspiracies really work in nonfilmic terms. Like, how do good people wind up doing bad things, and how can all of these people who are operating together in a cabal -- how can they each be motivated by separate reasons? TODD KATZBURG: And we couldn't tell the story of invading the Middle East for oil, because it's already happened. It was the plot of the Bush administration. But what we felt was that the themes were so universal, secrecy and corruption, that we could very much tell a contemporary story that addressed those same themes.